Brent Toellner is the senior director of National Programs for Best Friends Animal Society. In this role, Brent oversees all of Best Friends’ regional teams as well as network partner programming and business intelligence. Brent joined Best Friends in 2016 as the regional director of the South Central and Great Plains regions and was responsible for connecting, consulting, and collaborating with animal shelters, advocates, spay/neuter groups, and rescues across the 11 states in the two regions. 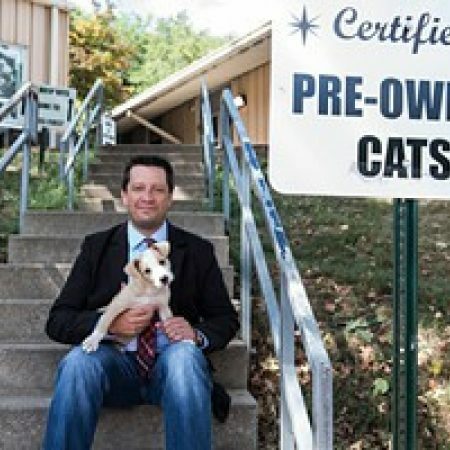 Prior to joining Best Friends, Brent, his wife Michelle, and a few others co-founded the Kansas City Pet Project (KCPP). In July 2011, they formed KCPP to bid on the contract to run the Kansas City, Missouri pound — a place where, for decades, more animals died than were saved. Since KCPP took over in January 2012, adoptions have increased by more than 200 percent. KCPP has now had a live release rate of more than 90 percent for five consecutive years while remaining an open-admission shelter, making KC Pet Project one of the largest open admission no kill shelters in the nation. In 2017, KCPP finished the year with a 96 percent live release rate. Brent has a bachelor’s degree in journalism from the University of Missouri and a master's degree in marketing communication from the University of Kansas. Brent lives in Kansas City with his wife Michelle and share their home with both dogs and cats.